Campsite Domaine le Pommier is a large stunning 5 star campsite that lies within 70 hectares of wooded grounds on the outskirts of Villeneuve-de-Berg. Although it’s one of the largest campsites in the Ardeche, Campsite Domaine le Pommier doesn’t just rely on size. The quality and quantity of its facilities and activities ensures that you really will have everything on offer that you could possibly want from a family campsite. The campsite benefits from stunning views out over the Gladuegne valley and Ardechois hills and the surrounding area is perfect for those who love to get out and explore by foot, bicycle or by car. The Ardeche region of France is extremely well known for the variety of sporting activities that are available. Campsite Domaine le Pommier is well situated to take advantage of many of them because the Ardeche Gorge and the Pont d’Arc are just 20 minutes away. At various locations along the river Ardeche you can book canoe and kayaking trips. Villeneuve-de-Berg is a traditional French town, the centre of which offers a variety of shops, cafes, restaurants and other amenities that you may need whilst on holiday at Campsite Domaine le Pommier. If there’s one thing you’ll want whilst on holiday, it’s a fantastic swimming pool complex. Campsite Domaine le Pommier has one the largest and one of the best on site pool complexes in France. Standing in 1.2 hectares of grounds, the pool complex boasts 3 swimming pools, 8 normal slides, 4 further giant slides including a half pipe, turbo cyclone, family slide and thrilling aqualoop. In addition to all of this there’s a splash area with full sized pirate ship, jacuzzi and plenty of sunbeds. 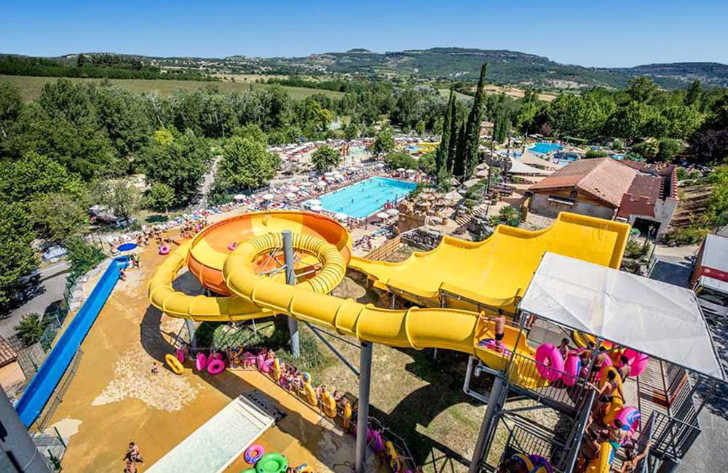 Campsite Domaine le Pommier is a huge fun and active family campsite that boasts a massive range of on site activities and facilities. On site activities at Campsite Domaine le Pommier include multi sports field, tennis court, table tennis, mini golf, football, playgrounds and boules. Facilities available at Campsite Domaine le Pommier include WIFI, restaurant, snack bar, takeaway, bar, groceries, animation team, games room, tv room, washers and dryers. Accommodation at Campsite Domaine le Pommier includes a range of 3 bedroom mobile homes that are available from Suncamp.